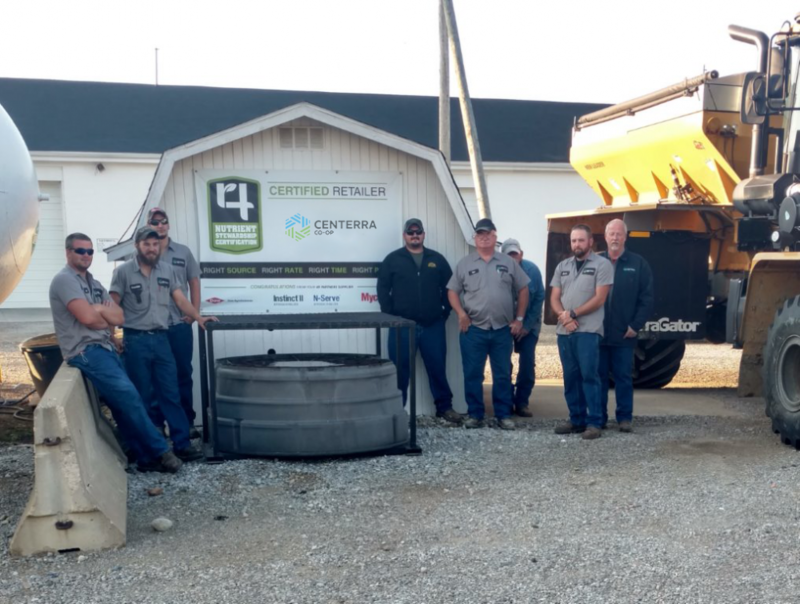 Continuing its commitment to improving water quality in the Western Lake Erie Basin, Centerra Coop Loudonville facility has achieved certified status for year two through the 4R Nutrient Stewardship Certification Program. The voluntary certification program is a concentrated effort by the agriculture industry to significantly reduce and prevent applied nutrients from running off fields, which has contributed to water quality issues in Lake Erie. Facilities are required to meet certain program goals each year to retain certified status. With the program in its fourth year, Centerra Loudonville joins a long list of retailers to achieve year two certification. “The 4R’s have made not only applicators but producers step back and take an extra look at how we are applying and using fertilizer,” said Greg Heiby of Centerra Loudonville. The Centerra Loudonville facility is an agronomy and grain facility, offering custom application of anhydrous ammonia, 28 percent, herbicides and dry fertilizer. Centerra works to be available for the producer and educate the community. “Our location is right by a highway which puts us in the public eye and makes us take extra time to ensure we are doing things the right way,” said Heiby. Approximately 2.8 million acres and nearly 6,000 grower customers are serviced by the 45 facilities in Ohio, Michigan and Indiana that have earned 4R Nutrient Stewardship Certification. “The certification program is an ongoing effort for participants and we are proud of the continued commitment shown by Centerra Loudonville facility, ” said Carrie-Vollmer Sanders, Nutrient Stewardship Council chairwoman. The 4R Nutrient Stewardship Certification Program is governed and guided by the Nutrient Stewardship Council, a diverse set of stakeholders from business, government, university and non-governmental sectors with a common goal of maintaining agricultural productivity while also improving the quality of the Lake Erie Basin and other waterways throughout Ohio. The program is administered by the Ohio AgriBusiness Association. For more information, visit 4Rcertified.org, email info@oaba.net or call 614-326-7520.